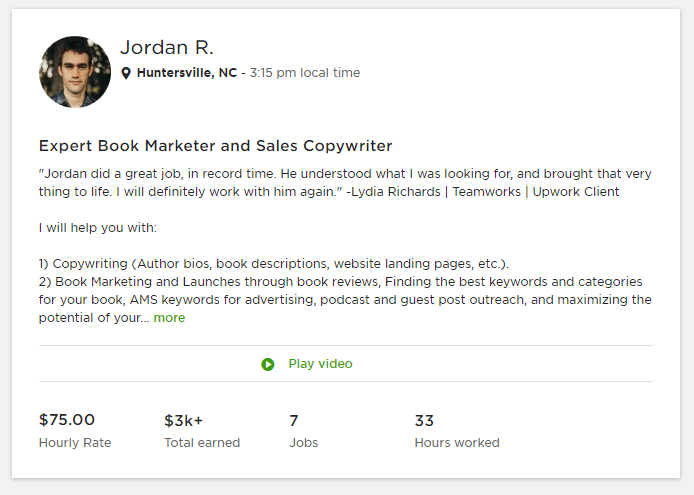 Jordan here, wanted to share a pretty incredible story with you: How I earned over $3k on Upwork in just a few short months and only 33 hours of work. I still can’t believe the above is true, but it is, and it feels so good! This post isn’t about why you should get on Upwork, even though I do recommend you give it a try. That’s not what we are going to be talking about here. Instead, I want to show you how a book can give a level of credibility and authority that is currently unmatched. When you publish a book on a topic that people care about and can relate to, magic happens. Becoming a thought-leader in your field of expertise and/or passion will elevate you to a whole new level. One way to do this is to “write the book on it” and become an established expert. Whether you opt for self-publishing or go the traditional route, writing a book is a step in the right direction for many businesses and brands. When you write a quality book on your chosen niche, you immediately level-up in authority and positioning within your field. If you are skeptical, just take a look at my numbers again from above. Sure, they don’t match some of the bigger gurus in the field, but writing a book shows people you mean business and know what you’re talking about. At the time I didn’t know it, but this is what I did when I wrote Book Launch Gladiator: The 4 Phase Approach to Kindle Book Marketing Success in 2018. In the book, I share my experience of marketing four self-published books as an author with a small platform. I list strategies of how authors can start from nothing and still market their books effectively with the right goals, a plan, and proclivity to hustle. The book shows exactly how someone that fits the mold of new author can still find success. The book received great reviews and is now my #1 marketing tool and business card to share my services with prospective clients. At the time, these comments floored me. 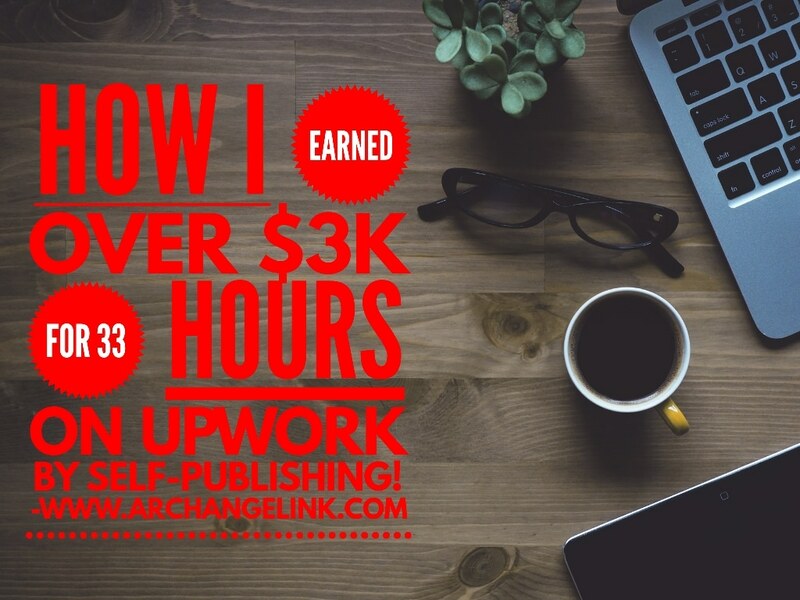 I hadn’t written my book for the purpose of working on Upwork and finding the right clients. I wrote it primarily to boost the credibility of my launch package with Archangel Ink. It’s only after the book’s launch and the above comments that I realized I had a powerful calling card in my hands. With the writing of my book, I had an easily accessible and extremely powerful business card that I could share with clients. This realization was powerful and eye-opening. It set me apart from other people submitting proposals with only marketing experience. Having a book on the subject elevates me as an authority on the subject of launching books as a new author. This client was telling me I was undercharging at $75 an hour? What!? This is the power of knowing your own worth, and then sharing that knowledge in the form of a book. This is exactly what clients want to hear. If you can make a client feel this way, they will close every single time. Here at Archangel Ink, we believe the #1 reason you should write a book is to build a platform or expand your current following. Writing a book is one of the best ways to accomplish this goal. Platform building involves many different facets, but creating a book can quickly elevate you above others in your field. I can’t tell you exactly how much of a boost in credibility you’ll get from writing a book, but I know that it’s worked for me, and it will work for you. I love writing books and have become more attuned to the process over time. When it comes to marketing books—I enjoy that process even more now. I’ve found that my love of marketing and helping new authors has become the perfect way to support my ultimate goal of writing works of fiction and becoming location independent. Writing a book has become a source of revenue and credibility in ways I could have never expected. In it, the hero and legend himself, Rob Archangel, shares a series of emails that will get you on the right path to deciding whether publishing a book is right for you and your business. If you want to get on the right path towards financial freedom and desire business and personal growth, writing a book might just be the golden ticket you’ve been looking for. At the very least, I am sure you would agree it’s worth considering. Until we meet again, best of luck to you as you continue on your entrepreneurial journey.